Government of Gujarat has launched a State Livelihood Mission - Mission Mangalam with the objective of bringing about an overall improvement in the economic status and standard of living of the poor and thereby improving the human development indicators of the State. 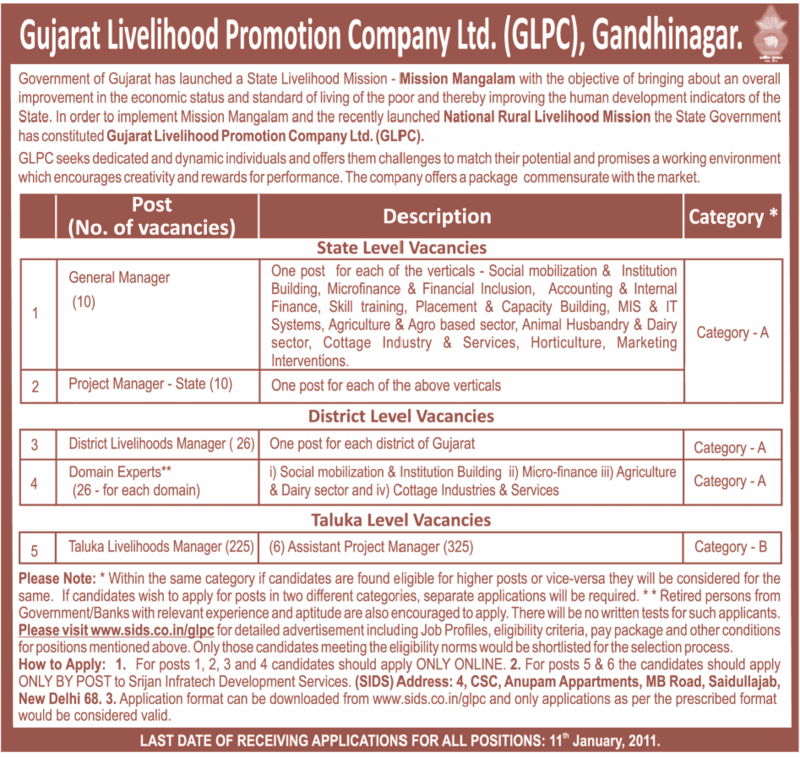 In order to implement Mission Mangalam and the recently launched National Rural Livelihood Mission the State Government has constituted Gujarat Livelihood Promotion Company Ltd. (GLPC). GLPC seeks dedicated and dynamic individuals and offers them challenges to match their potential and promises a working environment which encourages creativity and rewards for performance.The company offers a package commensurate with the market. One post for each of the verticals - Social mobilization & Institution Building, Microfinance & Financial Inclusion, Accounting & Internal Finance, Skill training, Placement & Capacity Building, MIS & IT Systems, Agriculture & Agro based sector, Animal Husbandry & Dairy sector, Cottage Industry & Services, Horticulture, Marketing Interventions. Please visit www.sids.co.in/glpc for detailed advertisement including Job Profiles, eligibility criteria, pay package and other conditions for positions mentioned above. Only those candidates meeting the eligibility norms would be shortlisted for the selection process. How to Apply: 1. For posts 1, 2, 3 and 4 candidates should apply ONLY ONLINE. 2. For posts 5 & 6 the candidates should apply. ONLY BY POST to Srijan Infratech Development Services. (SIDS) Address: 4, CSC, Anupam Appartments, MB Road, Saidullajab, New Delhi 68.3. Application format can be downloaded from www.sids.co.in/glpc and only applications as per the prescribed format would be considered valid.